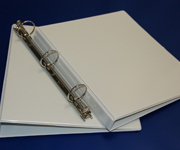 We stock premium PVC and PP Clear Overlay binder flats and recyclable ring metals to custom fit your binder with the mechanism of your choice. Plastic Film Corporation's removable ring mechanism promotes recyclability as well. Snap-in 3 Ring metal available in Round or D Ring - 5",1",1.5",2",2.5" & 3"
As part of Plastic Film's mission to develop innovative and responsible green products that also reduce the costs of packaging & shipping, company founder John Bittner developed a removable ring metal. 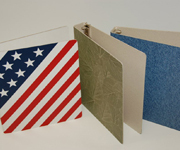 This allows consumers to build their own presentation binder by matching ring metal sizes and styles to our quality PFC clear overlay Binder Flats or the option to produce custom Binder Flats of your choice. With its Quick Release feature, our ring metal enables consumers to easily separate it from the binder flat. By simply popping out the metal, cutting away the plastic and separating the paper board from the plastic, the flats and metals can now be inter-changed, re-used or recycled. Using our recyclable Binders, retailers benefit from reduced SKUs & cost savings in reduced packaging materials. Our removable ring metal also reduces packaging and freight costs by maximizing product shipping space, delivering more product & less air on each skid. Retail displays are available for presentation & demonstration. 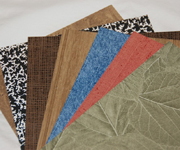 Our PP and PVC binder flats are another product line manufactured with the user in mind.